All-new personal structured illumination super-resolution system for the individual lab. Introducing an all-new super-resolution system for the individual lab. Achieve 2x resolution at half the price! Utilizing structured illumination microscopy (SIM) technology, the all-new N-SIM E realizes double the spatial resolution of conventional optical microscopes (to approximately 115 nm). 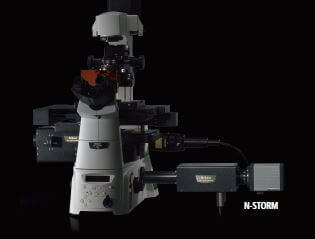 N-SIM E is a streamlined, affordable super-resolution system supporting only essential, commonly used excitation wavelengths and imaging modes, making it an obvious choice for individual labs. 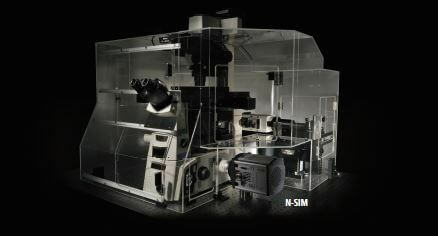 The N-SIM E utilizes Nikon’s innovative new approach to “structured illumination microscopy” technology. 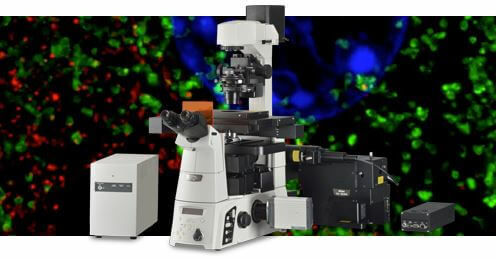 By pairing this powerful technology with Nikon’s renowned CFI SR Apochromat TIRF 100x oil objective (NA 1.49), the N-SIM E nearly doubles the spatial resolution of conventional optical microscopes (to approximately 115 nm*), and enables detailed visualization of the minute intracellular structures and their interactive functions. N-SIM E provides fast imaging performance for Structured Illumination techniques, with a time resolution of approximately 1 sec/frame, which is effective for live-cell imaging. 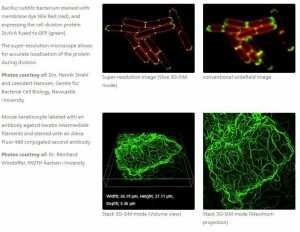 Slice 3D-SIM mode allows axial super-resolution imaging with optical sectioning at 300 nm resolution in live-cell specimens. Optional Stack 3D-SIM mode can image thicker specimens with higher contrast than Slice 3D-SIM mode. Analytical processing of recorded moiré patterns produced by overlay of a known high spatial frequency pattern, mathematically restores the sub-resolution structure of a specimen. Illumination with a known, high spatial frequency pattern allows for the extraction of super-resolution information from the resulting moiré fringes. An image of moiré patterns captured in this process includes information of the minute structures within a specimen. Multiple phases and orientations of structured illumination are captured, and the displaced “super resolution” information is extracted from moiré fringe information. This information is combined mathematically in “Fourier” or aperture space and then transformed back into image space, creating an image at double the conventional resolution limit. Capture multiple images with structured illumination that is shifted in phase. Repeat this process for three different angles. This series of images are then processed using advanced algorithms to obtain super-resolution images. 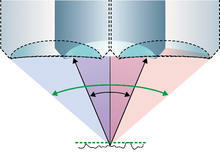 The capture of high resolution, high spatial frequency information is limited by the Numerical Aperture (NA) of the objectives, and spatial frequencies of structure beyond the optical system aperture are excluded (Fig. A). 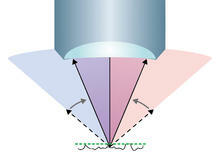 Illuminating the specimen with high frequency structured illumination, which is multiplied by the unknown structure in the specimen beyond the classical resolution limit, brings the displaced “super resolution” information within the optical system aperture (Fig. B). Fig. B: The product of Structured Illumination and normally un-resolvable specimen structure produce recordable moiré fringes containing the specimen information at double the conventional resolution limit. Fig. C: Images with resolutions equivalent to those captured with objective lenses with approximately double the NA are achieved. 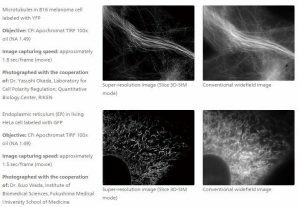 The system can be configured with either a 100x oil immersion type, which is suitable for the imaging of fixed samples, or a 60x water immersion type, which is optimal for time-lapse live-cell imaging. 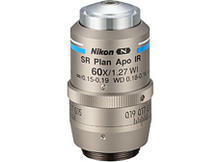 The SR (super resolution) objectives have been designed to provide superb optical performance with Nikon’s super-resolution microscopes. The adjustment and inspection of lenses using wavefront aberration measurement have been applied to yield optical performances with the lowest possible asymmetric aberration. 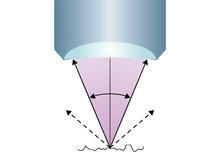 *These values are measured using 100 nm diameter beads excited at 488 nm. 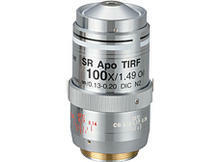 Actual resolution is dependent on laser wavelength and optical configuration.